Your child(ren) will enjoy 3 hours of fun activities led by our teaching artists featuring a giant obstacle course, live music, dance, games, a movie, pizza, popcorn, smoothies and more! Advance Registration highly recommended as Space is Limited. SAVE THE DATES: Details coming soon! 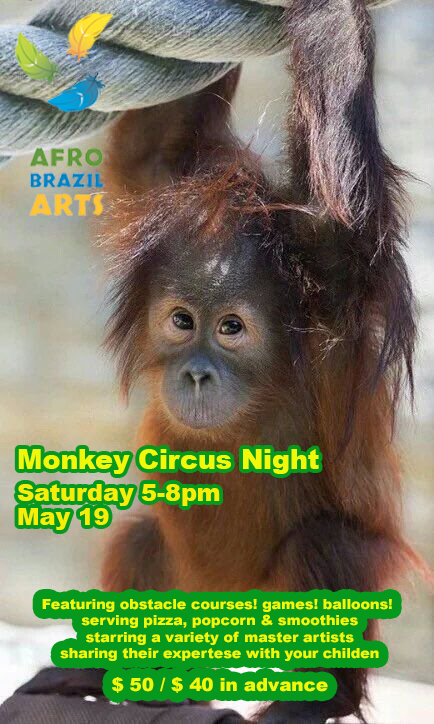 Your children will enjoy 3 hours of fun activities led by our teaching artists featuring circus arts, live music, dance, games, cartoons, pizza, popcorn, smoothies and more! 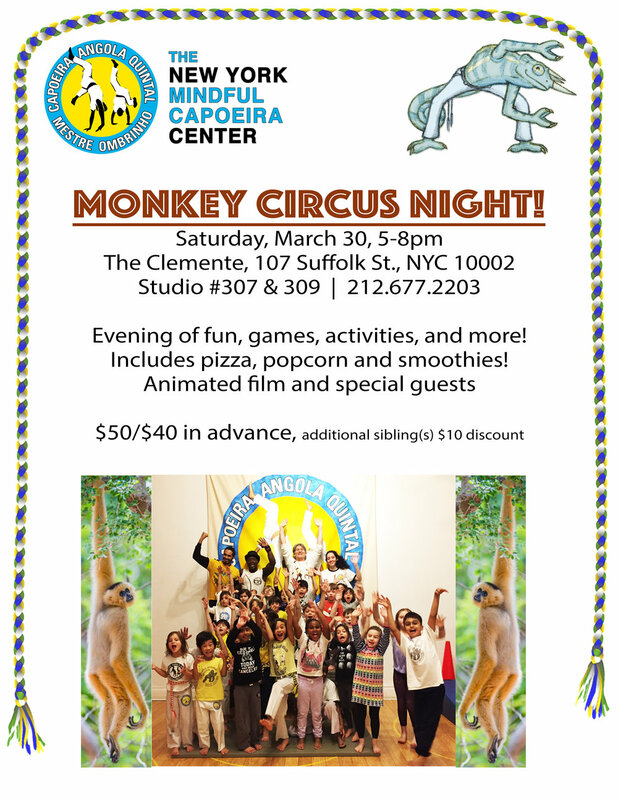 featuring Capoeira performance with guest masters plus your child(ren) will receive their first/next cord! 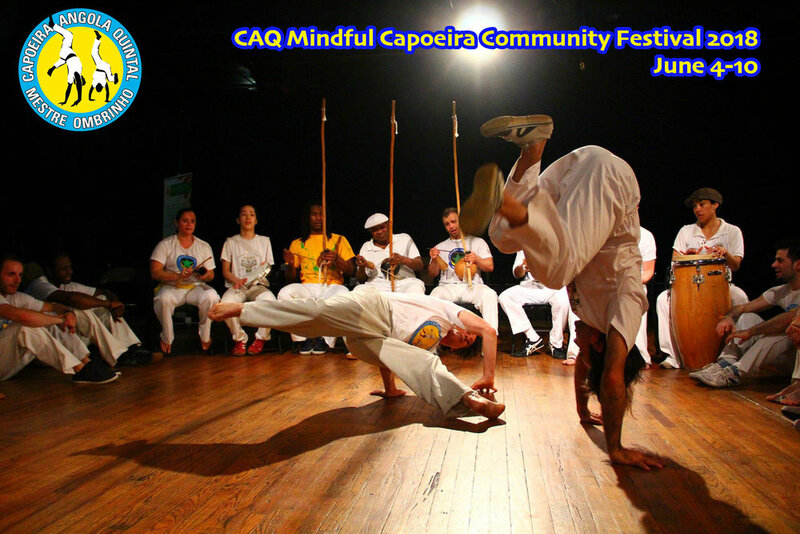 A weekend for the CAQ USA community and guests to gather and enjoy: capoeira rodas, guest teachers, Brazilian movies, drumming, samba, maculelê, food and drinks. Stay tuned for details coming soon. All levels welcome! No experience necessary. Please join us and bring friends for a festive celebration of Tropical healing, dance and music arts. Wear your favorite comfortable dancing clothes. Please note the Monkey Night has been changed to November 7, 5-8pm. Join us on Facebook for updates. More details coming soon! Professor Giratorio will be giving workshops at CAQ headquarters in NYC. April 5: Workshops 12pm-1pm hand balancing for capoeira, & 1pm-2pm Applying Acrobatics in the roda. 5:00 Cleason High Family arrives. A RODA OF RHYTHM AND CULTURAL EXCHANGE YOU WON'T WANT TO MISS!!! Mark your calendars for October 11 only 30 DAYS UNTIL THIS INCREDIBLE DAY IN THE COUNTRY!! Let's hope for good weather and beautiful fall colors! Bring a berimbau and drum if you have any for our music workshops! Also if you want to teach a song bring song sheets anything from Bluegrass Gospel to Capoeria to Motown and beyond!!!! 2nd Annual Capoeira Angola Quintal SF Festival and Batizado!